Here is my entry for this year’s LJ Saw Swap, and was my gift to HammerThumb. The pre-sharpened plate and brass back were purchased as a kit from LJ member ErikF…thanks, buddy! There’s certainly no way I could’ve pulled off this build without the plate from Erik. At least, not for another year. LOL. After securing the plate, I drew the tote design by combining images of a vintage Moses Eadon and modern Gramercy, then lengthened the tote slightly since my Gramercy feels sorta small in my big ole farmer’s hands. A bit of spray adhesive makes it easy to take the drawing right to the finished workpiece! Here you can see the roughed out tote getting the crucial slot to accept the plate…must be straight, perfectly straight, or what’s the point? And, yes, that’s a Bridge City Tool JS-7 you see clamped gently to my bench. Only the best for The Swap! 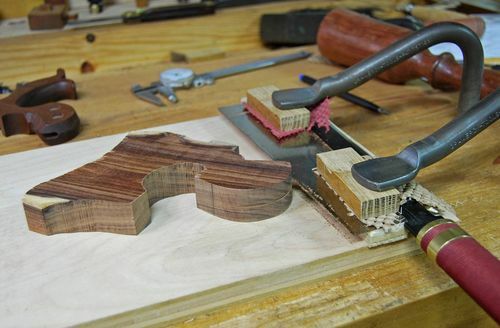 I even broke out the Bolivian Rosewood for the build; even though I’m allergic to it! 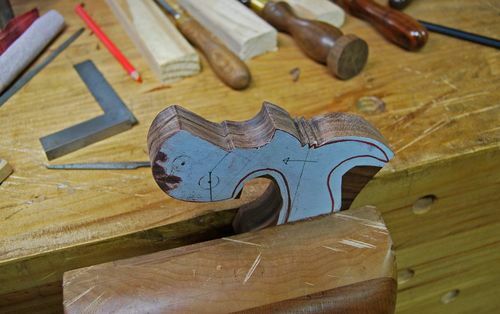 And, of course, what better time to break out the Gramercy Saw Tote Makers Rasp? LOL. 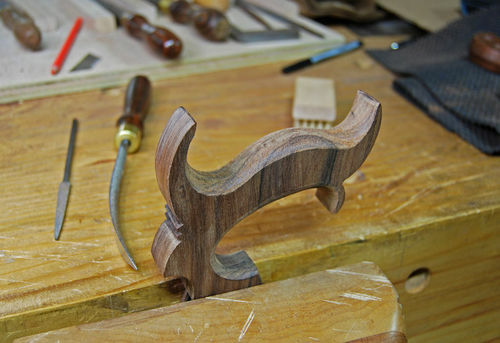 Believe me, this tool is worth every penny at this task…and others I’ve discovered. I hope you like the tote, HammerThumb! I already know the teeth are sharp, but cannot take credit for them. And Thanks to Waho for hosting this swap…lots of work, and well done! I think that will look good on my wall??? You made a lovely job of that Terry. Nice bit of wood too. 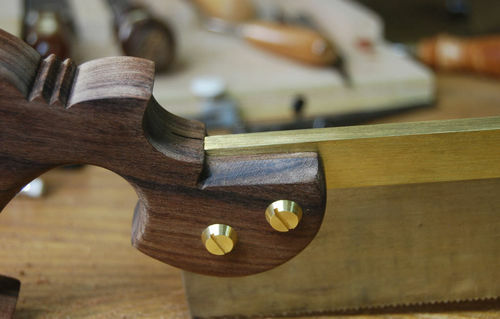 That is a fine looking saw, bet it cuts as nice as it looks! Sorry August. It’s mine and you can’t have it! ;-) Awesome job. It works great and its nice to look at also. Well done, and much thanks Terry. Wow, you really made a nice looking saw. The tote is awesome looking. Excellently done, as always, Terry. I like the shape of the leading edge of the back and plate. Did you file that or did it come that way from Erik? Terry your work always impresses. Great job again! Sorry August. It s mine and you can t have it! ;-) Awesome job. It works great and its nice to look at also. I have this lie Neilsen cross cut and I’m not happy with it. Beautiful work! When I first saw the photo I thought it was a Lie Nielsen. This is the first time I have seen someone improve the looks of a Bridge City Tool! Awesome looking saw, glad I could supply a few parts for you. The look of the coned bolts is pretty sweet. Great work Terry. Tote looks flawless. Saw envy out the yin yang. So inspired to make my own saw after seeing such nice work.